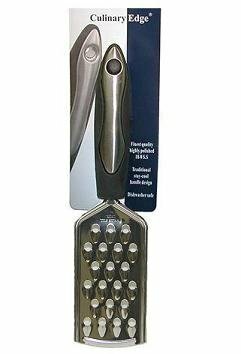 Grate cheese for fresh pasta, pizza, or chocolate to top off a bowl of ice cream with the Culinedge big hole grater. Featuring 18/8 stainless still course grating and non-skid rubber handle for better control, you'll look for something to grate with every meal. If you have any questions about this product by Culinedge, contact us by completing and submitting the form below. If you are looking for a specif part number, please include it with your message.